Welcome to Doug and Mary's Flags. Have you been looking for the perfect way to display the American flag at your campsite or maybe you've always wanted a flag pole for the front yard that's compact and easy to install. Please let me introduce you to the Rotating Flagpole. The Rotating Flagpole displays the flag at a 45 degree angle and the entire assembly pivots with the wind, just like a weather vane. It only takes a slight breeze for the flag to wave and the pole to rotate. The upper portion of the flagpole that the flag hangs from is easily removable when you want to bring the flag in. It’s hand made with durable 3/4” pvc plastic pipe a 1/2” steel conduit ground stake and 3 steel snap rings to attach or detach the 3 x 5 American flag from the pole. It's approximately 8 foot tall and compact in design, which makes it great in any situation, whether it be in your front yard or the Rv park. And it’s a snap to put up and take down. Installation instructions will be included. All you need is a hammer. If your in need of a light weight, portable flagpole for your Rv or front yard, look no further. 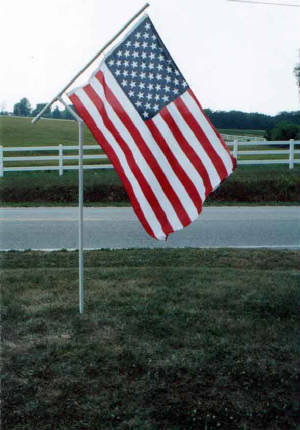 The Rotating Flagpole is priced at only $22.95 + shipping. Please click on the "Payment & Shipping Options" link for further information. We greatly appreciate your word of mouth advertising, please tell all your friends, neighbors and fellow Rv owners about the Rotating Flag Pole.